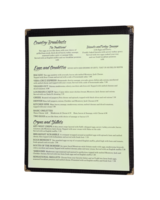 Menu Covers made with the same construction and materials as our deluxe cafe menu covers, just with fewer options, so we can offer them at wholesale prices. 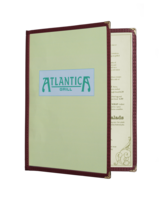 We use the same crystal clear menu panels, (sorry non-glare matte menu panels are not available at the present time) stitched to colored imitation leather binding. 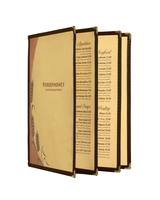 Gold metal corner tabs with a scroll design protect the corners of the menu covers from damage. Panels have a double row of stitching with thread to match the color of your choice of colored binding. Binding is reinforced imitation leather with the edges tucked under for a tight, clean, professional look. Available in the colors and sizes shown. Not sure about our quality? Try these menu covers for 90 days. 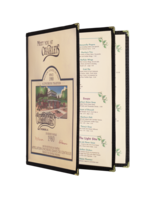 If you're not satisfied with the quality, return them for a full credit toward the purchase of our Deluxe Cafe Style Menu Covers. 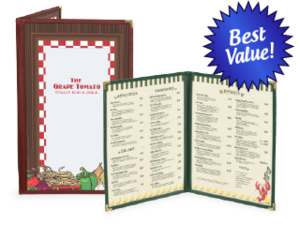 Your full two year guarantee on our Deluxe Cafe Style Menu Covers will start when you receive your new menu covers. 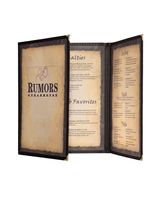 Cafe Style Menu Covers. Four Colors. Shop online with the Menu Shoppe today.